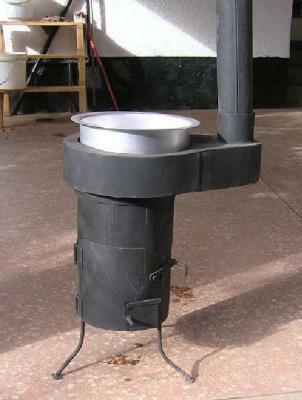 Jiko Mbono is Swahili for Jatropha Stove. This is an early version of the stove, it is now using That stove was an early prototype. It is no longer using whole seeds but instead pellets made from the pulp left over after the pressing of jatropha oil, although there is only one pelletization facility for this in Tanzania and no distribution arrangements. Now only, the Jiko Safi uses whole seeds. Jiko Mbono was developed for burning whole Jatropha seeds. The stove is a TLUD (Top-Lit UpDraft) gasification stove with natural draft air supply. Earlier development of Jatropha stoves have mainly been based on the use of Jatropha oil. But the use of Jatropha oil in stoves have had some problems. In wick stoves the problem have been on the high viscosity of the oil which makes it difficult to climb wick to feed the flame, this has caused the wick material to burn. Jatropha pressurised stoves have also the problems of keeping the nozzles clean, and also the complicated design which tends to make the stoves relative expensive. I therefore got the idea to burn the seeds directly in the stove. If the gasification process could provide the heat in the stove to vaporize out the oil from the seeds in the form of gasses, that will save us the work of first mechanically pressing the oil out of the seeds. I therefore started some experimentation with some simple stove design, and these first experiments showed that it was possible to burn the whole seeds in a stove. Further developments was however needed to get an efficient and user friendly design of the stove. I contacted Dr. Hassan M. Rajabu from College of Engineering & Technology at University of Dar es Salaam so that we could further develop the stove and test the stove after each modification. In this development we have received valuable economical support from the US based organisation Partners for Development and also support from Pamoja INC. Engineer F. Lauwo from Tanzania Engineering and Manufacturing Design Organisation (TEMDO) have provided assistance in producing the prototypes of the stoves. The fire in the stove is normally started by having a few crushed seeds that are soaked in methylated spirit or kerosene. These crushed seeds are placed at the top of other seeds in the fuelbox and the fire is lit in these crushed seeds. The initial process can be started inside the stove or outside. When some seeds at the top got good flames (3-5 minutes) the fuelbox is then placed on the shelve at the bottom of the stove door and the door is closed so the fuelbox get into its position in the centre of the stove. In this initial phase the primary air is kept fully open. The pyrolysis of the seeds by supply of primary air will gradually build up and the gasses from the pyrolysis will raise by the draft from the stoves internal chimney and be burned at the top by mixing with the secondary air. 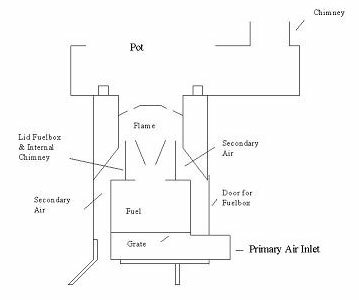 During this gradually build up of heat the primary air supply need to be reduced such that enough secondary air can be supplied to allow for a good combustion of the gasses. The burning of the Jatropha seeds is undertaken in batch portions. After all the seeds in the fuelbox have been pyrolysis the fuelbox need to be taken out and refilled for a new burning. It is not possible at this stage of the development of the stove to refill the fuelbox when the stove is operating, such refilling will just results in heavy smoke. With a full load of fuel 300 – 400 gram of Jatropha seeds the stove can burn for 1 to 1½ hour when used in real cooking where the fire is somehow turned down. During test we have recorded specific fuel consumption on around 52 gram seeds per liter of boiling water, and an energy efficiency around 44%. However, the high efficiency is atributed to the design of the top part of the stove where the top is inserted in a skirt. When operated properly the carbon in the seeds will remain as some kind of charcoal. The use of renewable fuel is important here in Tanzania, where most of the biomass fuels are harvested in natural forests which takes year to re-grow. We have estimated that a household having 200 – 300 meters of hedges of Jatropha trees will be able to meet their own need of fuel for the household cooking. Jatropha is often planted as hedges, it is a good hedge plant, as it is not browsed by goats, cows or other animals. Also as a hedge plant it does not compete with food crops on cultivating areas. For urban households in Tanzania Jatropha is a viable alternative to charcoal. A farmer here gets 150 Tsh for one kg of Jatropha seeds (exchange rate 1350 to $). In town the Jatropha seeds will sell for around 300 sh. An urban household will need around 2 kg seeds per day to meet their energy need for cooking, that gives a monthly energy bill of 18,000 sh. If the same households are using charcoal it will on average consume 3 bags of 30 kg charcoal of a price of not less than 15,000 sh, this gives a monthly energy bill of minimum 45,000 sh. The use of Jatropha will in this way represent a good saving and alternative to fuelwood and charcoal. Other seeds and crop wates can also be used in the stove. We know that seeds from the Croton tree burns well so does Castor seeds. We have also tried and found that the shells from cashew nut burn well in the stove. These shells are mainly a waste product from small-scale Cashew nut processing plants which are scattered in regions growing cashew trees.. We also believe that other seeds such as the oil palm kernel could also burn well when cracked a little. There will likely be many other oil holding seeds that could be used in such a stove.